Rushing out the door, I went over the list in my head. Workout pants and layered tees—check. Running shoes—check. Coat, hat, gloves—check. Keys and sunglasses—check. MP3 player—check. Everything was in order as I pulled out of the driveway. Fifteen minutes later I pulled into a parking space at the Power Valley Conservation Nature Center, a 112-acre oasis in suburban St. Louis created by the Missouri Department of Conservation with hilly trails perfect for raising my heart rate for 30-40 minutes. But as I stepped out of the car and began to gather my gear I realized with dismay I’d left behind a critical component—my earbuds. The thought of a run without my workout mix, and without any caffeine in my system either, was disheartening. I need the motivation of a musical pulse. But I didn’t have time to go back to the house so I set off anyway, prepared to suffer. About 10 minutes later I realized I was running to a faint drumbeat. At first I thought someone who had NOT forgotten their audio equipment had the volume on their iPod turned up to 11. Once I realized the thumping came from the woods themselves, though, it wasn’t too long before I spotted the drummer, dressed more appropriately for jazz than heavy metal in the stylish black-and-white houndstooth jacket and jaunty red cap of a male downy woodpecker. In spite of the bird’s diminutive size—no more than 6” from head to tail-tip and weighing in at an ounce or less—his wardrobe set him apart on that overcast day from the slate-and-silver hickory bark backdrop. Downy’s are capable of making a noise disproportionate to their size. When a woodpecker is looking for a mate or claiming a territory, the sound of drumming needs to carry; building a nursery cavity using a beak as a jackhammer isn’t quiet either. But if you’re in the woods and the beat is more bongo than bass, hunger is probably acting as the drummer’s muse. A gentle tap, tap, tap betrays hollow spots beneath the bark where wood-boring insect larvae wait. Once dinner has been detected, things get… interesting. 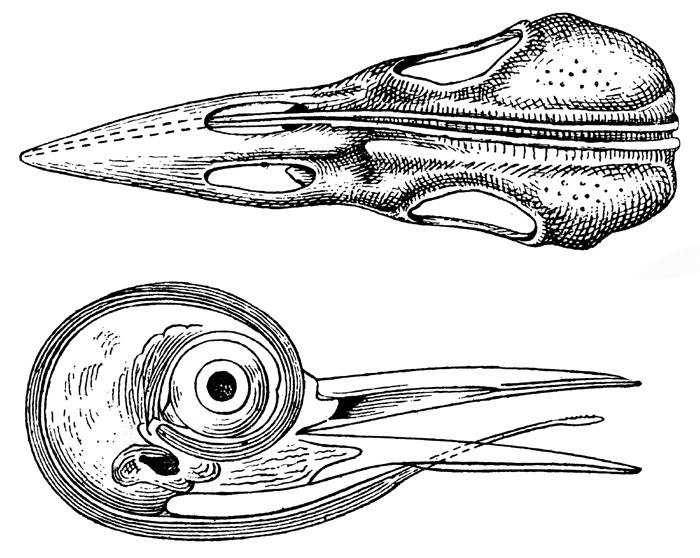 That short chisel of a beak hardly prepares you for what’s inside—like many other woodpeckers, the downy has a barbed, sticky, and flexible tongue so long it wraps around the skull when at rest. If ever there was a bird ready-made for rock ‘n roll, it’s the woodpecker. Gene Simmons got nothin’ on these headbangers. The whole tone of my morning changed in an instant. It’s so easy to carry a personal soundtrack wherever I go that I forget about everything I normally tune out when I turn up the volume. As a result of my oversight, I suddenly had a standing-room-only ticket to a great live performance, one I would surely have missed had this excursion proceeded according to plan. My run could wait. I stayed for several encores and gave that downy an enthusiastic round of applause as he flew off toward his next gig. 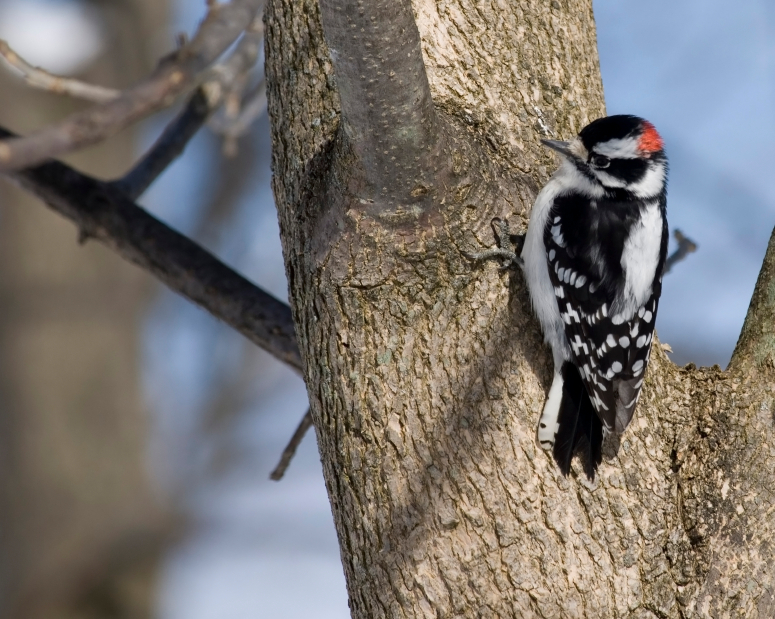 This entry was posted in behavior, bird behavior, birds, breeding behavior, clues and signs, downy woodpecker, feeding behavior, natural history, NDN Post, woodpeckers and tagged animal behavior, backyard wildlife, behavior, Biology, bird behavior, birds, downy woodpecker, Missouri Department of Conservation, natural history, Nature, Powder Valley Conservation Nature Center, suburban wildlife, urban wildlife, watchable wildlife, wild birds, wildlife, woodpeckers by Kieran Lindsey. Bookmark the permalink. Did not know about the Gene Simmons tongue! Gene is not my favorite person in the world but he did immediately come to mind when I found this illustration! When I lived in New Mexico there was a flicker who loved to use the metal chimney cap for his personal ads. What a racket when the drumming bounced down the flue and across the hearth into the house! Oh my! I can imagine the racket! Luckily they stick to the trees here. Kieran–Tell me about your move and new location and I assume some new job interests. Assume you did get a touch of the bad weather. We got some cold but just a little bit of rain. My new flock story continue to be the pair of Egyptian geese. There are 10 goslings that are about half grown. We may have the only breeding stock of the goose in North America. I’ve got a great picture of mom and dad taken in early spring but just can’t get the whole family except on my iPhone. That does not do them justice. The half grown males of the brood are starting to get their orange legs. Might not have sen you the picture since you were moving and doing so many new things. San Antonio zoo isn’t missing Egyptian geese as they have never had any. Some rancher is missing out on his lovelies. Maybe they just needed a little more freedom to reproduce.